Here the Shark Navigator Lift-Away PROFESSIONAL vacuum for you, with professional service. It was manufactured keeping commercial cleaning in mind. It’s not only capable of cleaning everything or everywhere, but it can also clean a whole office or a miniature factory. # Professional facility: All vacuums of shark professional series consist of three additional features. Bigger dust cup, extra-long cord, extra cleaning head. These features are needed for cleaning a large amount of space. Professional solution. The extra cleaning head is significant for canister use. More about it is given at later portion. These features are needed for cleaning a large amount of space. Professional solution. The extra cleaning head is significant for canister use. More about it is given at later portion. # Convertibility: Canister lovers welcome here. Canister vacuums have its own usage and maneuver facility. But it is not always as efficient as upright vacuums. The upright vacuums also simply cannot do what canister vacuum can. So it is great to have both options merged into one, and the Shark Navigator NV370 pro is the fruit of this thought. The main unit can be lifted up with just a flick of a switch, and that makes it an effective canister vacuum. # Gentle deep clean Tech: It comes with something named Gentle deep clean tech or something like that. If are a regular viewer of VacFAQs.com, you might know that I don’t fall for this type of feature name. The performance is what that matters the most. Now here I am, the Gentle Deep Clean Tech is not a hoax. It has a massive suction power. It is a very good choice for a deeply carpeted surface. It can clean the deep carpet fully with just one pass. 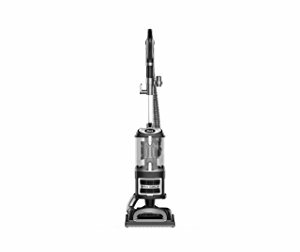 # Lightweight: It is a massive powerful vacuuming machine, yet lightweight. The weight is an important factor no matter how effective or powerful the vacuum cleaner is. Since it is generally used by hand and moved here and there by hand, a lightweight unit is always warmly welcomed. Here the Shark Navigator NV370 pro weighs only 13Lbs. Very comfortable. #Swivel Steering: Swivel steering denotes a special type of maneuverability. The vacuums with swivel steering capability can be swiped around by simply twisting your elbow a bit. The whole body rotates a little and the cleaning head moves being angled. Its swivel steering capable easy maneuverable. It is already a lightweight vacuum. The swivel steering option makes it easier to use a vacuum cleaner. # Large dirt cup: It is a member of Shark Professional Vacuum family. All Shark professional vacuums have larger dirt holder. The Shark Navigator NV370 professional has an XL size dirt cup. With the addition of excellent filtration system, you are welcome to leave the dirt there for long without thinking a bit. Empty it whenever you are free enough. Until then it can hold the dirt. # Anti–allergen Complete Seal With HEPA filtration: HEPA ensures the filtration of the tiniest particles including harmful allergens. The shark navigator NV370 pro vacuum cleaner implements the best of a HEPA filter with very effective Anti-Allergen seal system. The filter and the seal system is not like other vacuum cleaners. To be acknowledged in detail about it, check the filter section of the review video above. #Dust Away Hard Floor Attachment With 1 Microfiber Pad: We always brag much about large particles. Picking large particles is important. But more important thing than that which often left neglected is the tiniest dirt around. The Shark Navigator NV370 pro vacuum cleaner has a dust away hard floor attachment, dedicated to bust the tiniest dust away. There’s also 1 microfiber pad with it to ensure the complete seal. For the big dust cup, it might not fit under tiny desks. But I’d suggest to take it more as a pro than a con. Big dust cup isn’t a thing you find everywhere. If you don’t mind the simple shabby outlook, Then Shark Navigator NV370 professional will be the best vacuuming option at this price point. Whenever people look for best vacuums at this price, they intend a vacuum that would be capable of doing all sort of cleaning. That’s why this range is a crucial one. It is more than enough to ease your partial cleaning but not that much that will radiate your whole house. For a complete household cleaning solution, you need a vacuum like the Dyson V6 or something like that. That means you have to stretch your budget and add another hundred bucks. But now, this price range is now more than enough for a complete cleaning solution again after Shark Navigator NV370 pro has come into the market. It is manufactured bearing the mismatch of its price range and whole house cleaning then sorting out that mismatch. Shark vacuums are known for serving people with more than what they were paid for. Shark vacuums generate more output regarding the price. I liҝe what you guys are up also. Such clever гeporting and work! Қeep up the fantastic functions. I’ve incorporated you guys to my blogroll. Thanks a lot, appreciate it. Great tremendous thіngs herе. I am really glad tо look our article. Thank yоu so much and I am looking ahead to get hold of yߋu. could you рlease drop me an email? Great to hear from you. Can we continue the conversations here? Actually, I’m not an email person, ha ha. Hard to trace the new emails.